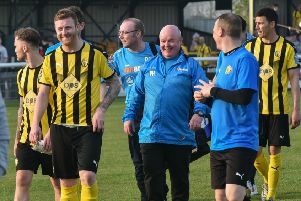 Brakes’ revival came to a shuddering halt as a throughly entertaining, well-matched contest turned on the sending-off of Leamington captain Danny Newton in first-half injury time, writes Paul Okey. The home side already felt a sense of injustice after referee Chris O’Donnell had allowed Fylde to take a 2-1 lead a minute earlier, believing there to have been a foul on keeper Ross Atkins in the build-up. However, that was magnified when Newton received his marching orders just over a minute later. A needless push into the back of Joe Booth from the Brakes skipper sent the midfielder tumbling to the ground and as Newton looked to hurdle the player he made contact with his boot, deemed by O’Donnell as a stamp and a straight red. From then on, it was damage limitation for the hosts, who showed excellent resilience until being undone by two goals in the closing ten minutes. The New Windmill was bathed in warm, spring sunshine for the visit of Dave Challinor’s promotion-chasers and the game exploded to life in the eighth minute. Danny Newton makes his way back to the changing room after being sent off. Lee Moore’s raking pass found Nathan Hicks, who slipped the ball first time through to Newton. The striker still had a lot to do but he cleverly worked the ball past the covering defender and steadied himself before driving a powerful left-foot shot past Ben Hinchcliffe and into the roof of the net. The Coasters’ response was immediate, with Atkins having to come out smartly to deny Danny Lloyd-McGoldrick. A Newton volley was straight at Hinchcliffe before the visitors drew level in the 11th minute. Adam Sumner’s throw into the box was headed on and Danny Rowe showed good strength to hold off Jamie Tank and turn to shoot past Atkins from eight yards. Play continued to swing from end to end, with Hinchcliffe out bravely to save at the feet of Hicks and Atkins producing a superb tip-over to keep out a Hannigan header, Josh Wilson nodding wide from the resultant corner. A Jamie Tank header was claimed at full stretch by Hinchcliffe who was then outshone by his opposite number who produced a superb reaction save to keep out Ritchie Allen’s close-range header. Hicks then had a gilt-edged chance to restore Brakes’ lead after a clever inside ball from Moore, but he was unable to force the ball past Hinchcliffe from eight yards out. The goalmouth action contined to come thick and fast, with James Mace failing to get a decent connection to a cross into the box, deflecting the ball over with his shoulder, and Wilson heading wide at the other end when well placed. Hicks and Lee Chilton both had shots blocked as Leamington showed no signs of an inferiority complex against their high-flying hosts, with Jordan Goddard also taking aim from long range, with his effort deflected over. But with half-time approaching, the complexion of the game well and truly changed. First, Rowe capitalised on Atkins’ failure to claim a free-kick into the box, stabbing home the loose ball as it fell from the keeper’s grasp. Then, Newton received his marching orders to leave Brakes not only a man short, but without a focal point for their attacking endeavours. Understandably the second half failed to match the quality of the first, with Brakes retreating into their own half and looking to catch Fylde on the break. However, despite the visitors’ bossing possession, they found it hard to create clear-cut chances. Their best chance came when Allen’s neat flick on the touchline took him past two men, but he was unable to find the finish to match his build-up play. Bilal Yafai and Jack Edwards were introudced with 25 minutes remaining as Paul Holleran looked to inject some energy into his flagging side and the two almost combined for an equaliser four minutes later. Yafai used his pace to shrug of the attentions of Tom Hannigan and pulled the ball back for Edwards who, off-balance, could only stab his shot wide of the near post. A fierce Connor Gudgerdrive from the edge of the box whistled wide off the post, but any hopes Brakes had of salvaging something from the game disappeared with seven minutes remaining. Delroy Gordon conceded a soft free-kick on the right flank and Sumner’s over-hit delivery evaded everyone in the box and went into the net via the crossbar. Two minutes later and it was a rather lopsided 4-1, Allen finishing neatly from the edge of the box after latching on to Hinchcliffe’s clearance. Brakes: Ross Atkins, James Mace, Connor Gudger, Joe Magunda, Jamie Tank, Delroy Gordon, Lee Moore, Jordan Goddard (Jack Edwards, 66), Lee Chilton (Matt Dodd, 79), Nathan Hicks (Bilal Yafai, 66), Danny Newton. Subs not used: James Fry, Lewis Fenney.